Are you tired of trying to draw up your own content from scratch week after week? Running out of ideas, or struggling to generate enough content to keep your audience engaged? Content curation is the answer. It allows you to pull from other great resources, which will save you an immense amount of time and energy. It also has a slew of other great benefits, including building great connections with other industry leaders and positioning yourself as a go-to source for the best news in your chosen topic. In these post I’ve put together 7 great content curation examples for your inspiration! 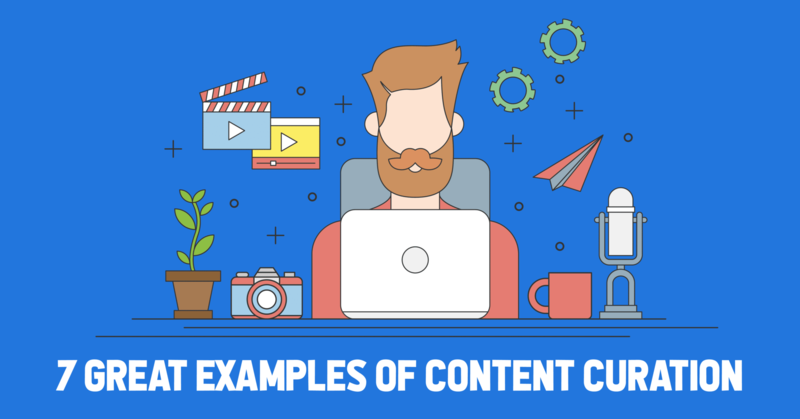 There are a lot of advantages when utilizing content curation to improve and bolster your content marketing overall, but in order to get them, you need to make sure that you’re executing the curation correctly. This often involves adding additional value to the content in some way. In this post, we’re going to take a look at 7 amazing content curation examples that you can draw inspiration from, along with some best practices to keep in mind when creating your own curation strategy. Zest is a chrome-based extension for marketers that allows them to share and discover industry content. This content is diverse, too; you can see videos, whitepapers, articles, and infographics, making the tool even more valuable. In order to keep overall quality high (and flagrant self-promotion low), all content that will be featured on Zest goes through a manual approval process. This ensures that only the best of the best is being shown in the feeds, which is exactly what readers want to see. Simply put, Zest’s entire existence is based on not only curating the best content in their industry but actually having other people do the curating for them. All they have to do is approve it. If that’s not genius, I don’t know what is. Even tho’ it can be overwhelming to have so many great marketing articles one click away every time you open a new browser tab, Zest has become my favorite curated source of marketing news. Brain Pickings’ tagline is “an inventory of the meaningful life,” and it’s a great example of curation for the purpose to entertain. Creator Maria Popova puts together entertaining and interesting articles that contain a collection of assorted quotes or theories from other people. Think poems, songs, and more. She even gets creative with this, as some of these people are great thinkers or writers dated back several centuries. She’ll often tie this in with relevant artists or individuals from today’s time, bringing things full circle. Most brands use content curation to supplement their own marketing efforts, but some will actually monetize it. Launch Ticker is a great example of a brand that does just that. Launch Ticker curates the top stories in the tech industry and compiles them into brief email newsletters that can fill you in on everything big happening in ten minutes or less. Each story is summarized in three hundred words or less, making them exceptionally digestible, and features a link to the full story in case readers want more information. Members can comment on the stories and interact with each other, sharing opinions and what they think of the news, building a sense of community. When users first sign-up, they can get access to a free 12-month trial. After that, if they want to keep getting those emails, they need to pay $10 per month (or $100 per year on the annual plan). After those 12 months, readers are likely to be invested enough that they’ll pay, and in large numbers, that’s a great deal of profit for simple content curation. The flow of startups related news is just so overwhelming that I happily pay them $10 every month to get this great summary of the top news each day! 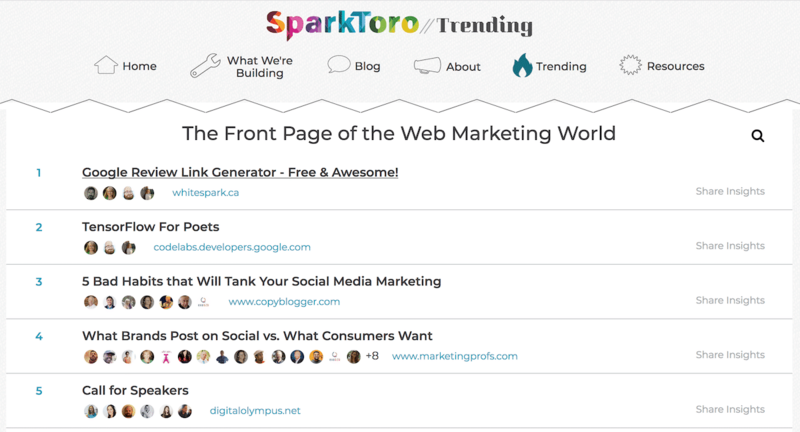 Sparktoro’s Trending is a section of the site that shows readers the top topics in the marketing industry. The tool compiles tweets from thousands of online marketers and prioritizes them based on the traction they get. Here’s how it works for readers. They see a feed of different topics, and can click on the ones that interest them. If they click on the topic title, they’ll be taken right to the article discussing it. If they click on Share Insights, however, they’ll see screen below. They can still access the article, but they’ll also see top tweets about the subject and other similar articles. This gives readers a big-picture view of what’s happening and how it’s being received in the marketing world. This strategy compiles not only great articles, but the immediate social response to those articles to add additional context to the conversation. This alone makes the tool worth using, and it sets it apart from competitors. If you write content that is statistic-heavy, this may be a strategy that you’re already using. Hootsuite is a great example of a site that focuses on research curation in some of their posts. An example is their post on the best times to post on social media. In these articles, they analyze massive amounts of research and data from third parties. They can compile this data into one hyper-valuable blog post, infographic, or video (or all three). They give credit where it’s due, which gives the originating sites powerful backlinks and a great platform with lots of readers. Hoosuite, in exchange, has created one exceptionally valuable blog post that readers will keep coming back to for a full and comprehensive look at the data. This is a great strategy if you want to provide actionable data to your audience, but you don’t want (or don’t have the resources) to run your own case studies. Big names and influencers can be powerful driving forces, and if someone sees their name on an article they’re more likely to click. INC’s expert curation posts like this one utilize that benefit to their advantage, compiling articles that feature knowledge from multiple influencers and experts that readers will be excited to learn from. They’ll compile these quotes and contributions into a single original post and publish it online. This strategy can take a little more time and effort than some of the others on the list; you may have to hunt down the experts to get original quotes and their permission. It also still requires you to publish your own content. That being said, it can get more clicks to your site, especially when those influencers start sharing, and build relationships with powerful industry peers. Lodging Interactive is a full-service marketing service that’s geared specifically towards hotels and resorts. 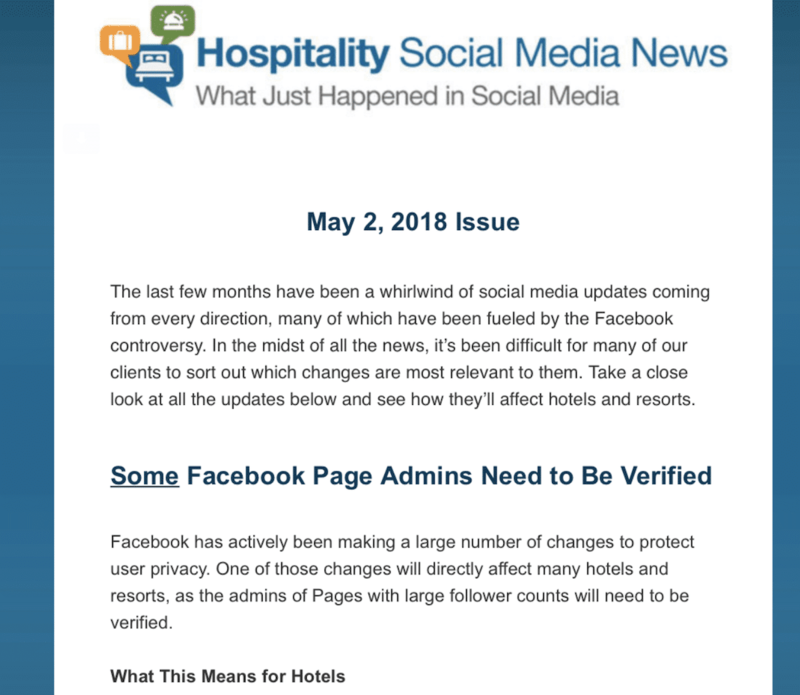 Their biweekly newsletter quickly summarizes the recent social media changes that are relevant to hotels and resorts, detailing what the changes are and how they will affect the hospitality industry in particular. They link to posts from social media and technology experts who first break the news, and then elaborate more. This is directly relevant to their audience. It works so well because they’re taking generic information and putting a valuable, relevant spin on it that their readers won’t find anywhere else. Their newsletter, as a result, demonstrates clear expertise, because while they curate news, they share their own actionable knowledge for how it will affect businesses in their specific industry. It also helps to establish a relationship early on with their clients, and show the value of a marketer who knows their stuff, both of which will help them sell their services more effectively. Never “curate” images that you don’t have the rights to. Copyrighting is a big concern, and people can (and will) go after you if you’re using their images without permission. Always link back to the original source. You should always give credit where credit is due. In this case, that’s the source that you’re curating the content from. This will build relationships instead of burning bridges, and it makes your content look more credible and well-researched. Win-win for everyone. Add your original take through summary or opinion. Don’t just copy their metadata or opening paragraph; share your take and put it into your own words. Otherwise there’s no point to reading what you have to say, which is the last thing you want readers to think. Start with content that’s high value to begin with. If users aren’t interested in the content on their own, they definitely aren’t interested just because you’re sharing it. Save content regularly to make ongoing curation a little easier. If you have a weekly post, newsletter, or just need more fodder for your social feed, make it a habit to save content regularly throughout the week instead of going on a last minute content-hunting spree right before it’s time to publish. This will help you actually find the best stuff out there and keep you from missing anything. Tools like Instapaper can make this easier. Content curation has a lot of benefits. It’s also a flexible concept that can be adapted to a large number of strategies. Each of these 7 sites utilized curation in different ways, giving us more inspiration for a strategy that will work best for us. What you choose will likely depend on your business, your goals, and your audience. As long as you’re adding value to the conversation in some way, you should be just fine. Let me know in the comment what other great content curation examples have inspired you! One of the most Zestiest mentions ever, Massimo! And a lovely list of tools and platforms.